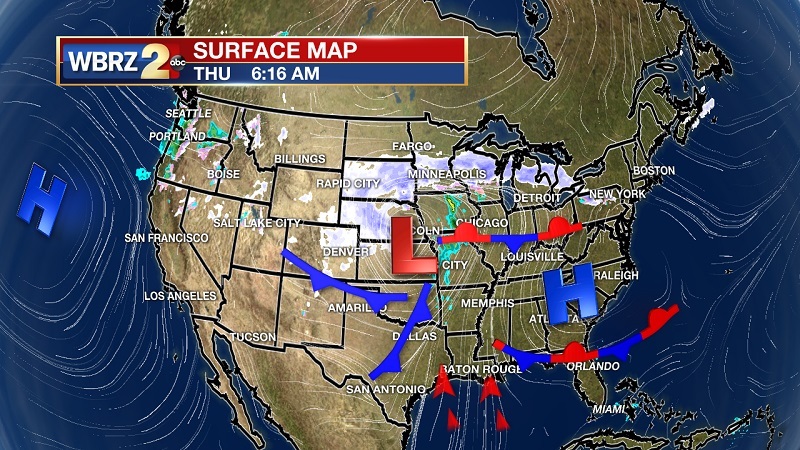 Today and Tonight: An approaching frontal system with two cold fronts associated with the strong low pressure will near the area today and stall late today. This will keep skies mostly sunny, and winds rather breezy. Winds will be between 10 and 15 mph out of the south, with gusts reaching 20 to 25 mph. 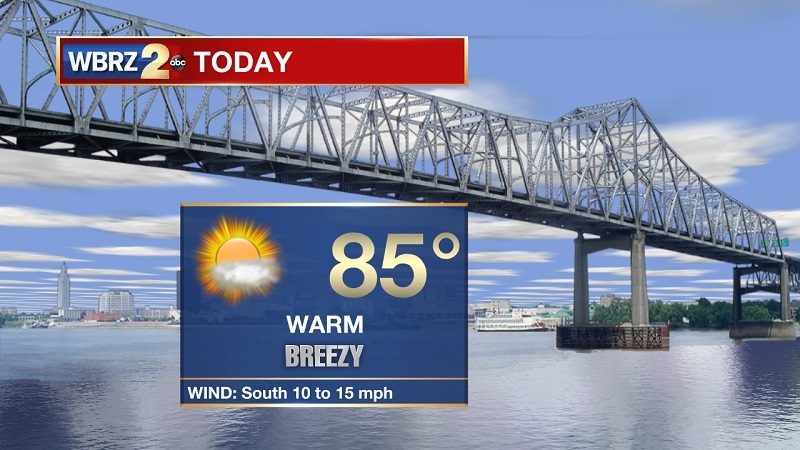 Temperatures will be warming into the 80s around lunchtime, with an afternoon high of 85°. Clouds will increase this evening, allowing for temperatures to slowly cool to an overnight low of 65°. Winds will also stay elevated out of the southeast, between 5 and 15 mph tonight. 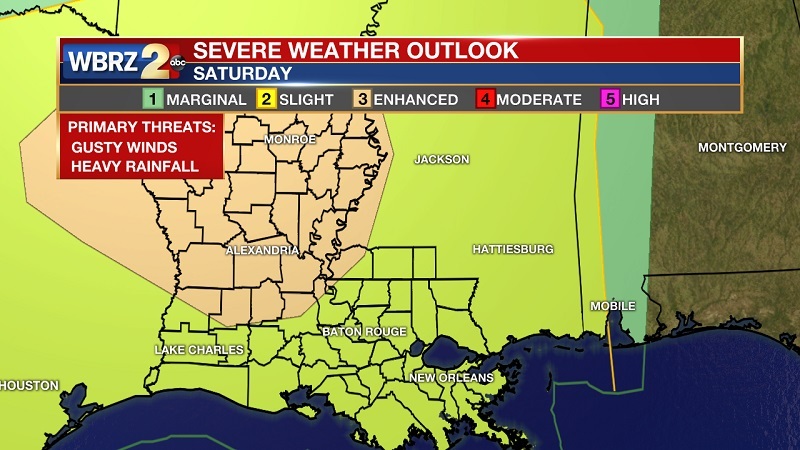 Up Next: Conditions degrade through the day on Friday, ahead of a system that will bring a return of strong to severe storms Saturday afternoon into Sunday morning. Sunny skies return on Monday, with high temperatures steadily increasing into the 80s by Tuesday. A strong frontal system is approaching the area, helping to increase cloud cover and keeping winds elevated through Thursday. Showers will be possible through the early morning hours on Friday, before transitioning into isolated storms through the afternoon. Showers will retreat to our north through the afternoon, with drier conditions through the evening and overnight period into Saturday. The main front will be pushing through on Saturday, especially through the afternoon and evening. The atmosphere will be primed for strong to severe storms, as significant instability and shear will be present into Sunday morning. Rainfall amounts are expected to reach around 2 inches, with some isolated areas picking up close to the 3 inch mark. The front finally moves off to our east by late morning on Sunday, as much cooler temperatures follow behind the front. 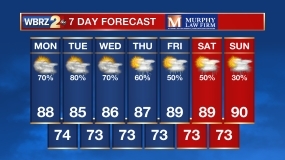 High pressure begins its reign into the early part of the workweek, as high temperatures break back into the 80s by Tuesday. Another system approaching on Wednesday will bring a return to afternoon storms which will likely linger into Wednesday night.